STEP #1: Add an hour. Take whatever time you plan to drive for the day and add an hour. Use that extra hour to explore some place off the highway. My favorite add-an-hour stops are small-town historic museums. Even if they’re closed, you can wander the grounds and appreciate the architecture and atmosphere. You might visit a city park or stroll through town or a scenic neighborhood. The point is simply to stop all that speedy motion so you can walk a little and enjoy the present moment. Note: I recommend limiting driving time to no more than eight hours a day, including the “add-an-hour” stop. STEP #2: Don’t neglect your hydration. Many people avoid proper hydration when they travel because they don’t want to make extra bathroom stops. 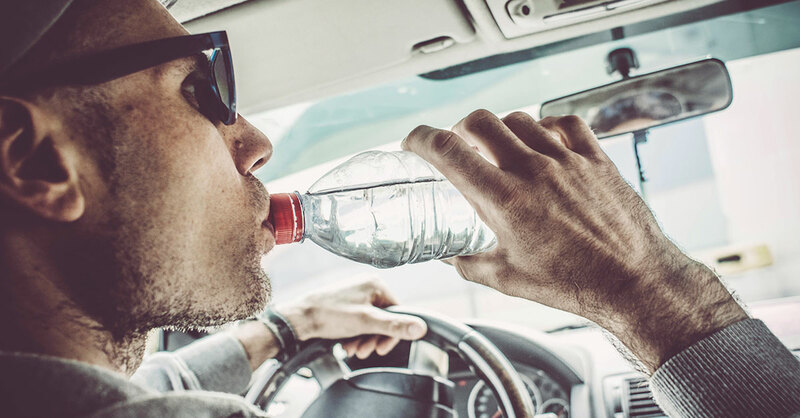 But dehydration makes people sleepy and irritable, and it can increase your risk for accidents. My advice: Drink half your body weight in ounces of water each day, and simply know that you’ll need to take more bathroom breaks. Hydrating foods, such as celery and melons, also can help but aren’t likely to send you to the bathroom as often. STEP #3: Stop at the grocery store. Think of car travel as a backpacking trip that requires you to have all of your supplies before you hit the road. Bring along items that are high in fiber and don’t need a cooler. Good choices include carrots, nuts, pumpkin seeds, oranges, grapes, plums, apples and almond butter and crackers. If you don’t have time to pack food or find yourself hungry for more, stop at a grocery store for fresh food and skip the standard fare at the gas station convenience store. STEP #4: Stay regular. For many people, constipation is a bane of car travel. Adequate hydration and frequent breaks (every two hours) that include brisk walking and forward bends (bending from the waist and hanging down as far as is comfortable) often solve this problem, but some travelers need additional assistance. One of my favorites is Smooth Move tea, produced by Traditional Medicinals. This tea is less harsh than most other laxatives. Keep the tea bags in your car, and drink a fresh cup—ideally before you go to bed at night—if you have not had a bowel movement for 24 hours. Caution: If you have a bowel disease such as diverticulitis or ulcerative colitis, check with your doctor before using any laxative, including Smooth Move tea. STEP #5: Boost your immunity and reduce stress. To strengthen the body’s immunity and help fortify it against stress, I often prescribe combined tinctures of Panax ginseng (an herb that increases alertness), astragalus and echinacea. The typical dose for adults is 60 drops (20 drops of each herb) in four ounces of water, taken 15 minutes before or after meals, three times a day, starting the day before you travel. Continue using throughout your trip and for a day after you return. You also can take any one of these (20 drops in two ounces of water three times a day) on its own.